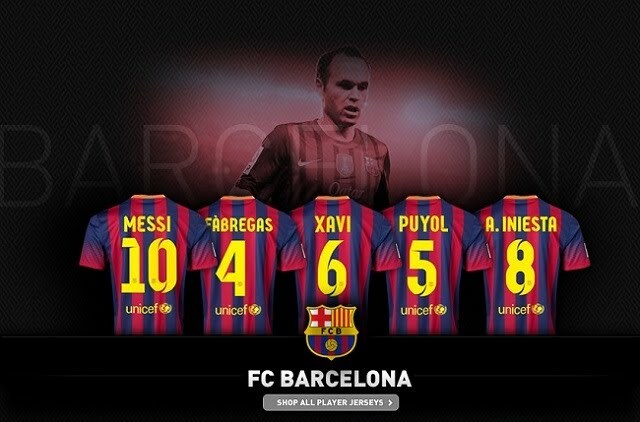 FC Barcelona 2013-14 Home and Away Kits released. 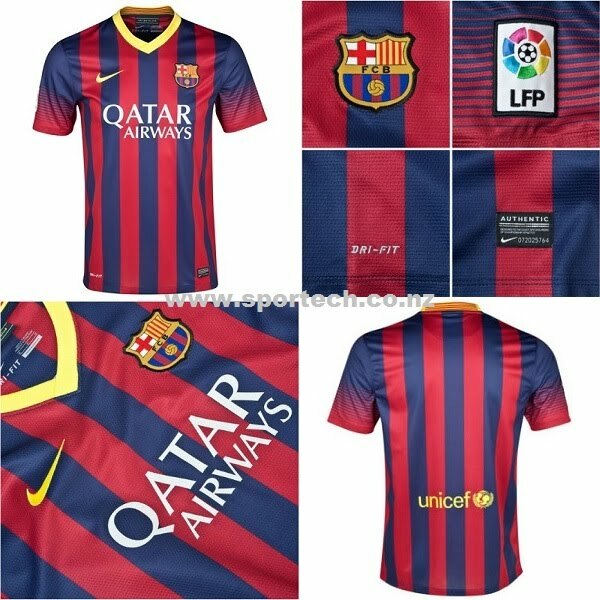 Barcelona 13-14 Kits are made by Nike and sponsored by Qatar Airways, who are taking over the sponsorship from the Qatar Foundation which was originally on a 5-year sponsorship through to 2016. 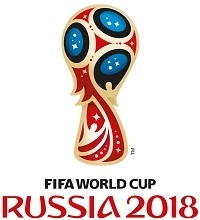 However, both Qatar organisations are owned by the Qatar government. 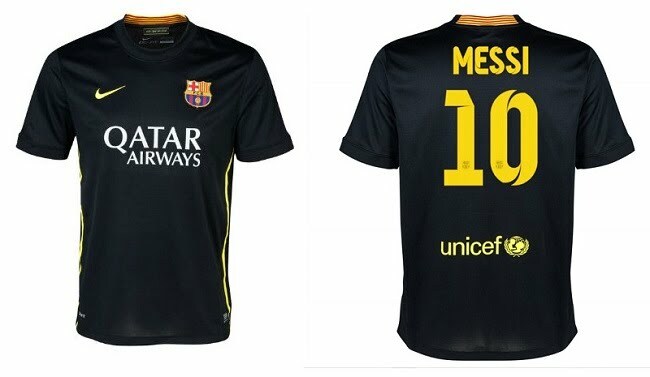 Unicef remains at the bottom of the back of the Barcelona 2013-14 shirt. 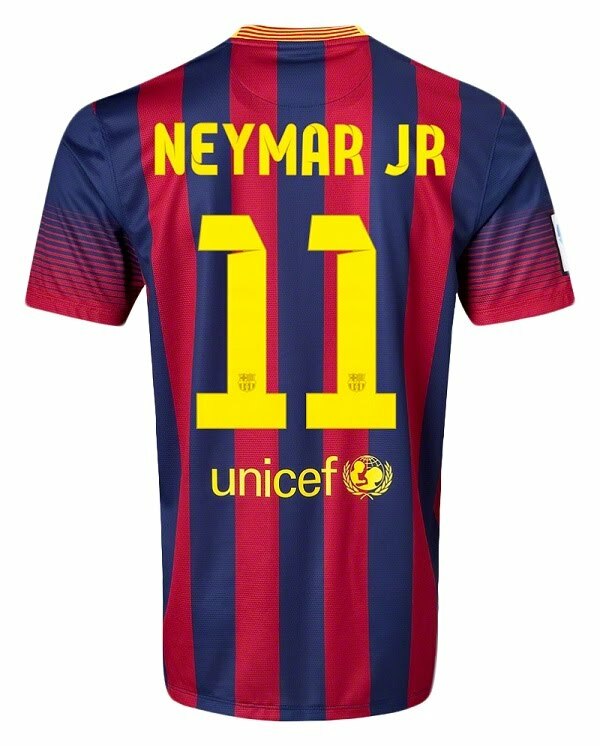 After two seasons with adventurous designs, for the new Barca 13/14 Home Shirt Nike reverts to the classical vertical stripes. The Home Kit features narrow horizontal stripes on the sleeves creating a transition effect. 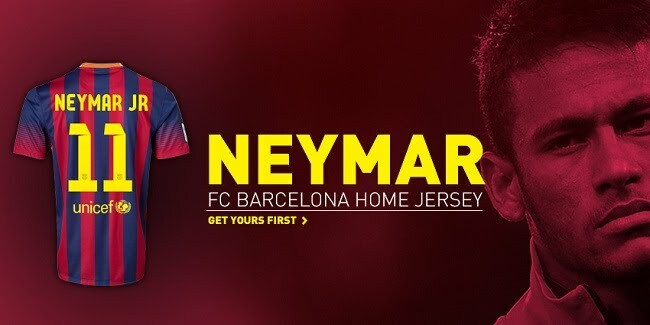 The V-collar is yellow and features the Catalan flag on the back side and the lettering Més que un club on the inside (More than a club). 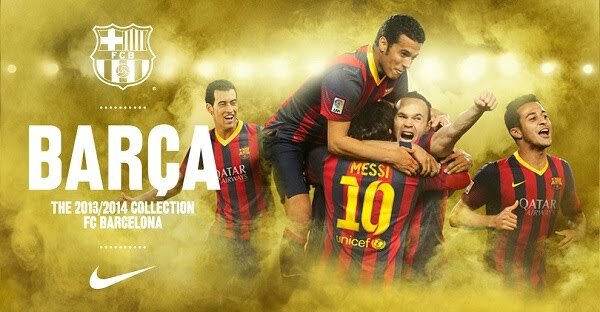 While the Nike and Unicef logos on the Barcelona 13-14 Home Shirt are yellow, the Qatar Airways logo is silver. The Home shorts are blue and the Home socks are red and blue, with a blue top and reducing horizontal blue stripes creating a transitional effect. 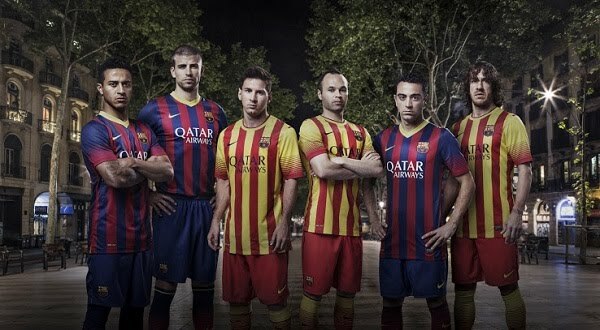 FC Barcelona 2013-14 Away Shirt is inspired by the Senyera's (Catalan flag) colors yellow and red. 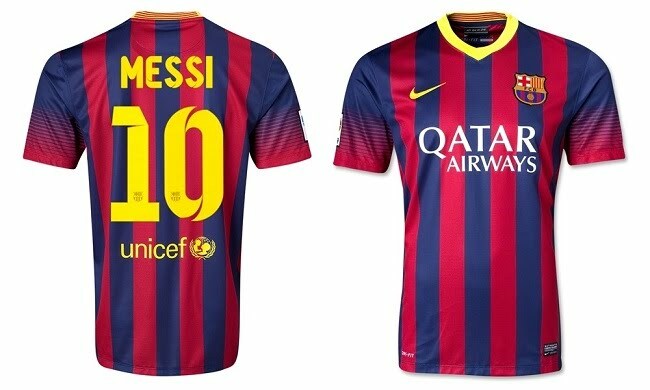 Nike and Qatar Airways logos on the new Barcelona 13-14 Away Shirt are colored navy. 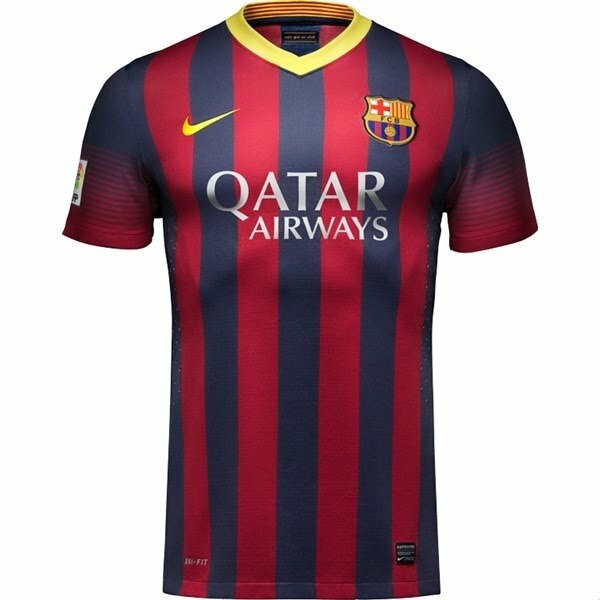 Unlike the Barcelona 2013-14 Home Jersey the new Barcelona Away Kit features a yellow round collar with a red trim at the top. 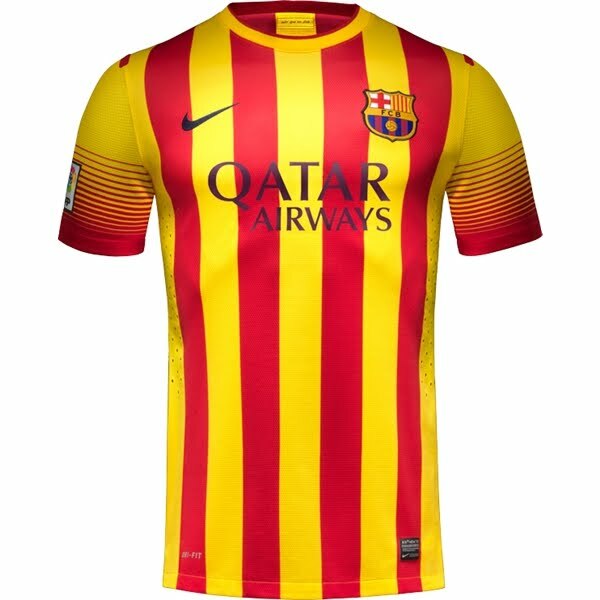 The sleeves of the new Barcelona kit are yellow and feature reducing red stripes on the sleeves creating a transition effect. 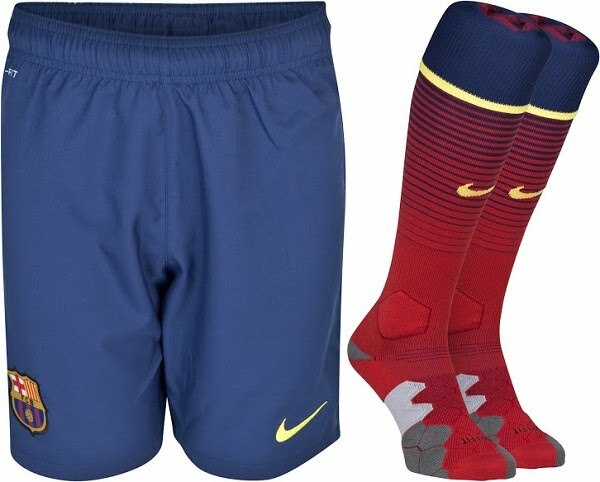 The Barcelona 13-14 Away Kit shorts are red with a black trim on each side and the Away Kit socks are red and feature a thin black stripe towards the top as well as the red and yellow fade stripes seen on the sleeves. What was earlier 'leaked' as the new Barcelona 13-14 Third Kit turned out to be the Barcelona 13-14 Keeper Kit. 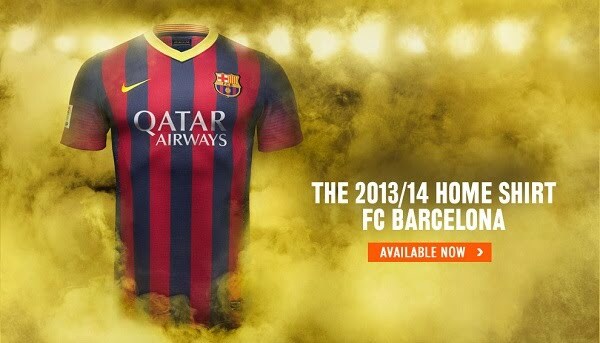 The Barcelona 13-14 Goalkeeper Home Shirt is black and grey. 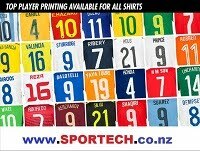 It features the same fading stripes on the sleeves as seen on the Barcelona 13-14 Home and Away kits. 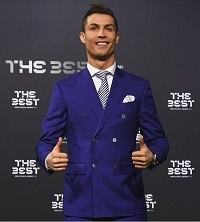 The stripes are used to create a transitional effect from the black upper part of the sleeves to the grey lower part. Barcelona 2013-14 Goalkeeper Home Kit shorts are black and Barcelona 13-14 Keeper Home Kit socks are black as well. The Nike FC Barcelona 13-14 Goalkeeper Away Kit is blue using a similar template as the Goalkeeper Home Shirt. 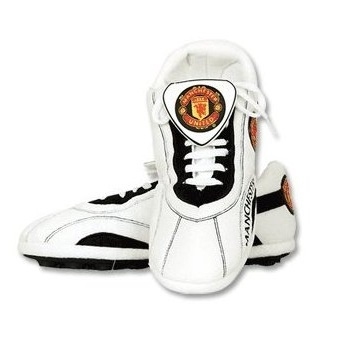 The Away GK shirt may sometimes be used in home games where it's a mo appropriate colour.